I’ve been making notebook covers for my various courses, using Rachel’s tutorial at Stitched in Color. 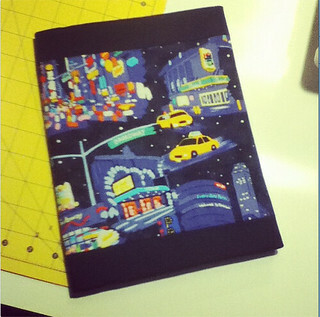 It turns out that this pattern is perfect for my long-cut quarter-yard NYC prints from the City Quilter. The next one will be black and white using the skyscraper print from City Quilter, in the same design as this one, and the third will be burgundy and yellow/gold, to match the colors of the Plantagenet kings. That one will be all red on the outside except for a thin vertical band of yellow at the edges, and the inside flaps will be yellow, with a pocket the right size for index cards. I tweaked the measurements for the tutorial, because I’m using 8 1/2×10″ spiral-bound notebooks instead of composition books. I cut my cover to 12.75″x32.5″ because the notebooks are a little bit larger, and followed the tutorial otherwise, while adapting the pocket flaps to be the right depth for my notebooks. It’s a great tutorial! Author AlisaPosted on August 24, 2012 August 24, 2012 Categories SewingTags finished!